I am super excited to get this week over with because we are leaving for our Thanksgiving vacation on Saturday! For the past six years, we have been getting together in Colorado for Thanksgiving. I think it’s more about the snowboarding and less about the dinner, but that’s totally fine with me. With my parents on the east cost and all of us kids on the west coast, it just makes sense to meet in the middle. We ski everyday and hang in the condo in the evenings. It’s my kind of vacation and I NEEED a vacation! So with vacation on the horizon, I am looking to keep thing easy. 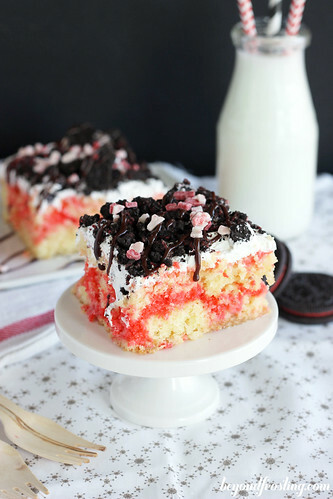 No cake could be easier to put together than this Candy Cane Poke Cake. 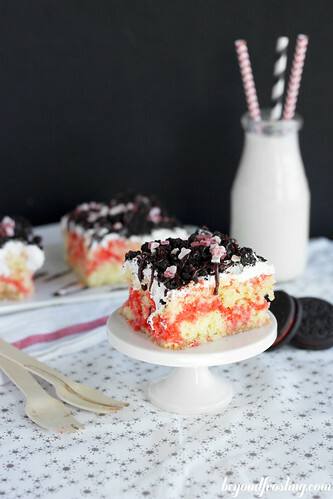 It’s one batter with a bit of peppermint flavor, some sweetened condensed milk and topped with whipped cream and candy cane Oreos. Have you ever had Candy Cane Oreos? Holy moly they are delicious. I like the added crunch it gives this cake! This cake is out of this world. The sweetened condensed milk keep the cake extra moist. The peppermint in the cake is just the right amount of flavor without being too overwhelming. My favorite part of this cake the red stripe! It is super easy. You take a ½ cup of the cake batter in a separate bowl. Then you just add some food coloring until the desired color. You pour the red cake batter overtop of the other batter already in the pan and swirl it with a knife. You want to be careful not to swirl it too much so that the whole cake doesn’t turn red. Now this cake can be made a day in advance or served within an hour of baking. How easy is that? Combine all ingredients (except for red food coloring) in a mixing bowl and mix thoroughly until eggs and oil are well combined. Reserve a 1/2 cup of batter in a separate bowl. Add red food coloring and beat until desired color. I prefer using Amerigel coloring, the gel is a little thicker than traditional food color so it prevents the batter from thinning out. I used the color “super red”. Pour remaining batter in a 9×13” pan, batter will be slightly thick; spread evenly with a spatula. 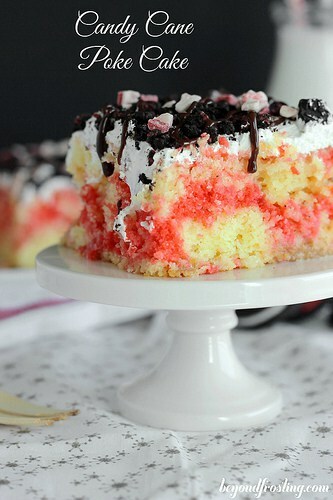 Pour red batter in strips over the top of the cake. 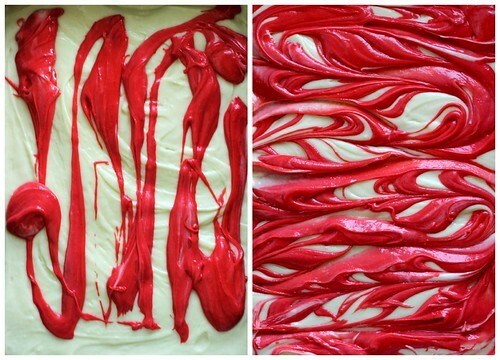 Swirl red batter with a knife. Bake at 350° for 18-22 minutes. Check your cake for doneness by inserting a toothpick into the center of the cake. If your toothpick comes out clean. Allow to cool for 10 minutes. Pour can of sweetened condensed milk over the top of cake and allow it to absorb in the cake until cake is cooled. Let set until completely cooled. Once cooled, top with cool whip and put in the fridge until ready to serve. Place Oreos in a large Ziploc bag, and use a rolling pin or heavy pot to crush Oreos into pieces. Sprinkle Oreos on top of cake. Sprinkle Andes Peppermint Chips for additional flavor. 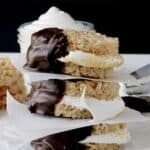 Drizzle with warm hot fudge sauce if desired. Due to the Cool Whip, this cake must be kept refrigerated. Do you like peppermint? I have a lot more recipes coming your way! Until then, check out these Peppermint Cream Thumbprint Cookies.